Home » travel » Travel Diaries - Island Hopping is love! Island Hopping is love! This statement summarizes my second day in Boracay. I've visited a number of beaches in my country. I've seen beaches in Batangas, Subic and Puerto Galera. Whenever I visit the beach, I'm usually contented on swimming and enjoying the scenery. Except for the trekking experience in Taal Volcano, I never had any other adventurous experience to share. When I stayed in Boracay, I told myself that I have to add a new experience in my list of accomplishments. I'm not getting any younger and I believe it might take another lifetime for me to visit Boracay. Hence, I decided to venture to island hopping. Island hopping is only one of the few activities you can enjoy in Boracay. Reef walking, parasailing, scuba diving, are some of the water activities you can avail. Island hopping is best experienced with your own group of friends. My usual companions during the trip were two of my female colleagues. With a group of three people, we can already take the island hopping adventure. However, lesser people means more share in the expenses and I believe it meant lesser fun too. With the help of my other colleague, we were able to form a group of eight excited and happy island hoppers. Aside from seeing the beautiful islands in Boracay, snorkeling, scuba diving and swimming are the accompanying activities you can enjoy with the island hopping experience. Armed with my rash guard, hunger for adventure and my equally brave and happy colleagues, we rode the boat that took me to the best ride of my life. The first stop of our island hopping is the Crocodile Island. The waves frightened us so we immediately told our tour guides to direct us to the next destination, the Turtle Island. We were still recovering from our frightening experience so I failed to capture shots of the island. Turtle island was a safer place to swim and snorkel. So off we jumped out of our boat and started the fun. Meet my island hopping buddies! We swam in the middle of the sea and this was an accomplishment for me. I love to swim but I never went to areas that my height can't reach. 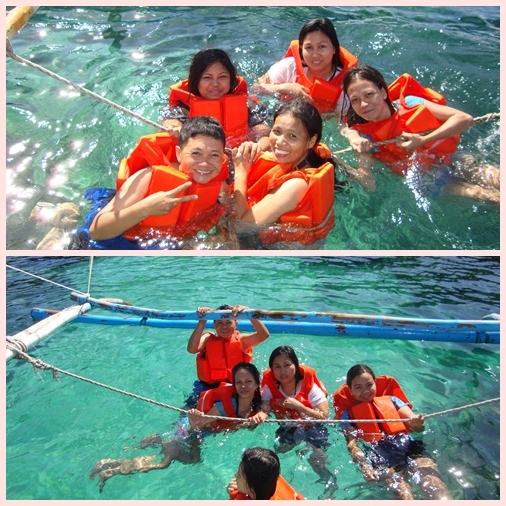 It was my first time to float and swim to a depth of around 12 feet and kilometers away from the shore. I was already happy and contented with our short swim at the Turtle Island. Since we have to maximize the three-hour limit, we moved out of the water for our next destination. Along the way, we were able to catch a glimpse of the luxurious Boracay Shangri-La. To prove that it's indeed high end, staying here would cost around Php 20,000 per day (around $400). Getting near Shangri-La's own shoreline is even prohibited by their management. West Cove is said to be owned by the Filipino boxing champion, Manny Pacquiao. Although I read in some sources that Pacquiao never admitted to own the resort. The resort resembles the structures of Santorini in Greece. In order to see the amenities of the resort, tourists are required to pay Php 150 (around $3) as entrance fee. We didn't bother to get inside the place because we were already contented enjoying the beach front. Our boat took us off here. Everything about this picture is so priceless. The whitest and finest sand and the crystal blue waters are things I can never experience in the city. We spent most of our time here. We took pictures and enjoyed so far the best beach I have ever seen. Here's a better shot of my colleagues turned adventure buddies. I have never seen this piece of heaven on earth in my entire life. And to prove that I really experienced the place, here's the photo that captured everything. Hi Diane! Oh, my! What a gorgeous place! I can almost feel the cool of the water and the warmth of the sun on my back. You're too cute. What an incredible experience. I just can't get over how clear the water is and how white the sand is. You all look like you were having so much fun and you look so happy with such a big sweet smile:-) Definitely an adventure you'll all remember for a lifetime. The water is so clear - it must've been so much fun cooling off from the heat! i love the pictures. you've captured the beauty of the place. i should be going there someday. Gorgeous Diane! I sure wish I was hopping those islands right now. I love the pic of you and your smile is priceless! Thanks for sharing your wonderful pics. You are so young and beautiful, dear Diane that you don't need any makeup! I love that pristine beach and hubby and I both laughed to see Crocodile Island! How amazing! I was never attracted to Boracay before because it's known for the night life, which I'm never really fond of. But your photos of island hopping makes me want to go there, like now! Haha. Island hopping in boracay, the thing that you should not miss most. You'll miss half of your life if you can't get to experience it. Btw, did you get the island hopping part of the package? Which boracay beach resort hotel it is? Hi Keith! No, it wasn't part of our accommodation package. Wow!! beautiful pictures!! Thanks for the share!